However, because the land was depleted of nutrients, some agricultural treatment might have value. And so the researchers, working with 36 plots and 32 native grassland species, set out to find the optimal amount of fertilizer and irrigation that would yield the greatest — and most diverse — amounts of biomass, while also resulting in underground carbon storage and minimal nitrate leaching. The result, after a decade of observation and analysis? More is not necessarily better. “Our results indicate that different intensification levels have different environmental benefits and costs,” said lead author Yi Yang, who is now a postdoctoral researcher at the University of Minnesota. In fact, moderate treatments with a low rate of nitrogen fertilizer and irrigation water resulted in the best biomass yields and carbon storage — twice the yield and storage of untreated plots. Meanwhile, the more intensively treated plots resulted in 30 percent lower greenhouse gas savings, 10 times greater nitrate leaching and 120 percent greater loss in plant diversity than their moderately-treated counterparts. While the results indicated that the energy yield from optimal management of prairie grasses was still somewhat lower per hectare than for traditional corn ethanol, the prairie grasses were grown on land too infertile for corn. Moreover, because much less nitrogen fertilizer was used than for corn and especially because of the high rate of carbon storage in soils, the bioenergy from the optimally grown prairie grasses gave much greater greenhouse savings. All this, with the benefits of ecological restoration. The promising results of this study lead to the notion that a more tailored, ecologically friendly approach to biofuel production could be beneficial in other regions as well, as we continue to explore ways to generate biomass for alternatives to fossil fuels. 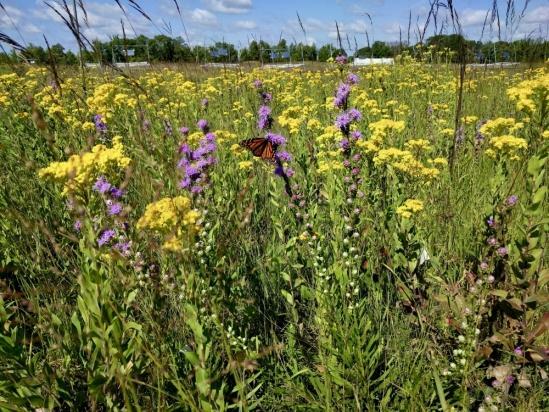 “Our study suggests that optimizing multiple environmental benefits requires sustainable intensification practices appropriate for the soils, climate and plant species of a region,” Yang said. Research on this project was conducted also by Clarence Lehman and Jared L. Trost of University of Minnesota (UMN). Photo by George Furey, now a Ph.D. student at UMN, Department of Ecology, Evolution and Behavior.